Family Friendly A manageable loop with majestic views of Sturtevant Falls and views of the canyon below. An Adventure Pass is required to park. Shaded Riparian forests with a 50-foot waterfall that gently winds up and over the canopy for expansive chaparral and mountain views. 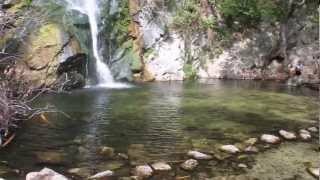 Sturtevant Falls is worth the short out-and-back on a spur trail. This 50-foot waterfall gushes in heavy winter rains. THIS TRAIL AND THE PARKING GETS VERY CROWDED ON WEEKENDS. The upper portion of this trail is somewhat exposed. Bring appropriate sun protection. This is a great hike, also called the Santa Anita Loop. It can be broken into shorter loops for small kids or extended into a serious day hike to Mt. Wilson. Hike down the paved road to the bridge junction and keep right to the Gabrielino Trail (NRT) 11W14. Follow the creek a mile or so until you come to the next junction. Keep right for a short out-and-back to Sturtevant Falls. Head back the way you came for about a quarter mile and take the Gabrielino Trail (NRT) 11W14 to the right. This takes you above the falls for a look down below. Continue on past the Cascade Picnic Area and Spruce Grove Campground. Turn left at the signed trail junction and take the Sturtevant Trail #11W16 towards Sturtevant Camp. Across from Sturtevant Camp, off to the left, is a junction with the slightly hidden Zion Trail #11W17. From here you can continue on Sturtevant Trail #11W16 which will take you to Mt. Wilson in 3 miles. This particular loop takes you about a mile up the Zion Trail #11W17 where you keep left to the Mount Zion Summit Spur. Take in the views and double back. Continue left on Zion Trail #11W17 which drops down to Winter Creek and a junction with the Lower Winter Creek Trail #11W15. It is the same distance back to Chantry Flat either way from here. Turning left takes you down the canyon but you have to climb that dreadful paved road back UP to the parking lot. Turn right and you soon reach a junction with the Upper Winter Creek Trail #11W23. Keep left and this takes you back to the parking lot. Bay, oak, maple and alder trees provide ample shade in canyon bottoms and north facing slopes. Watch for rare madrone trees on the Upper Winter Creek Trail #11W23. Monkey flowers usually prolific on sunny slopes in June. Deer and sometimes bear can be spotted early or late in the day. Watch for abundant poison oak. Along this trail are a few remaining cabins from the early 1900's. At one time, this area of the San Gabriel Mountains was a vacation hot spot until storms in the 1930's destroyed most of the buildings. These cabins are private. Please do not trespass.